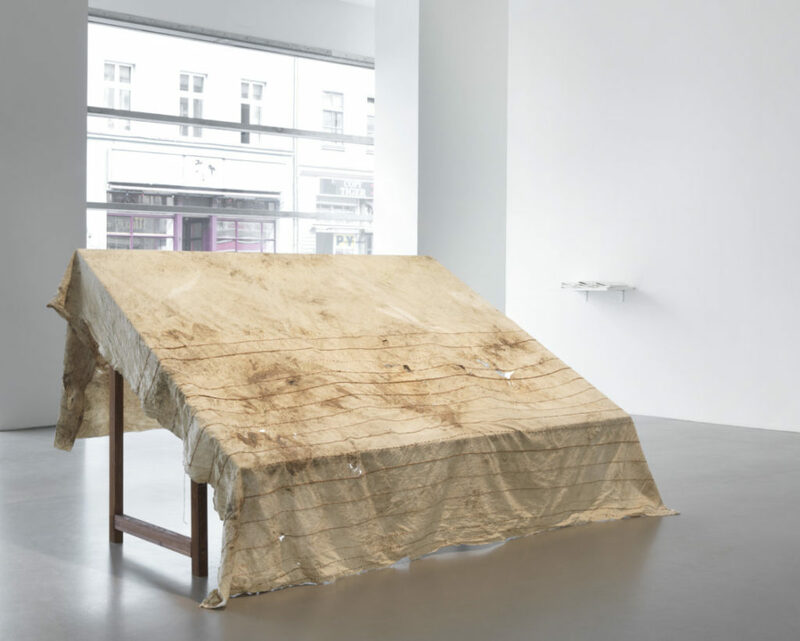 The daadgalerie presents two new projects by Mexican artist Teresa Margolles, created during her stay in Berlin. Teresa Margolles repeatedly addresses feelings of loss, pain, and emptiness provoked by everyday violence and its impact on individual destinies, on families and friends, and on a society in general. She works assiduously against the anonymization of the individual, the living, and the dead. Margolles became known for, among other things, monochrome canvases whose ostensibly abstract and painterly aesthetic conceals the fact that they have been soaked with the blood of individuals murdered on the street. And it is only with this knowledge that her radical realism reveal itself. The canvas serves simultaneously as a support for blood and as the conveyor of a gruesome story that has actually taken place. 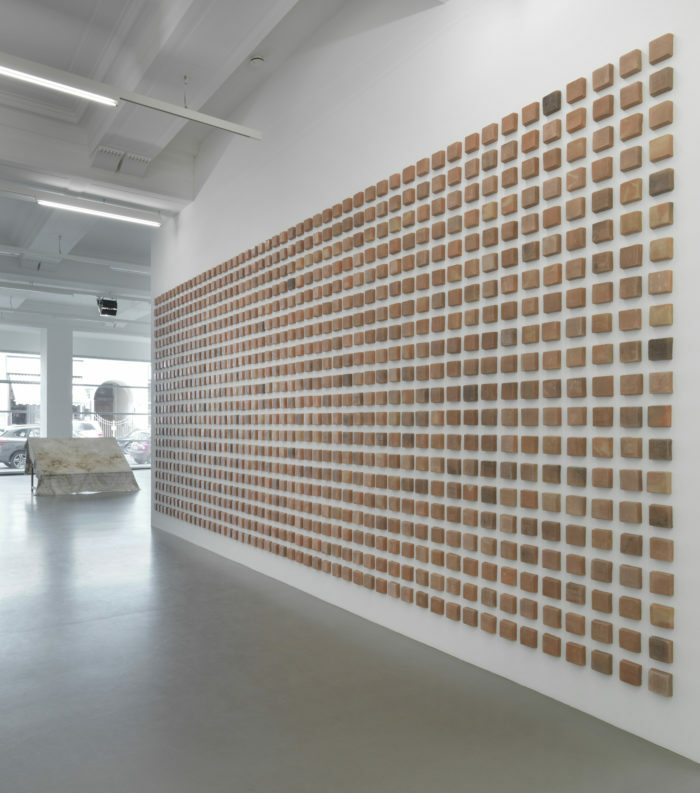 The resulting works fit formally into the canon of Minimal Art, but make their “impact” with substances such as blood, body fat, or the water used to wash corpses, causing “viewers” to lose their typically distanced standpoint. With Teresa Margolles the work of art is by no means autonomous, but a revealing substantiation of intolerable social circumstances. In recent years, she has focused in particular on violence against women in Latin America. Margolles’s experiences in Berlin inspired her to create the project The Others. Surprised by the number of young Mexicans and Central Americans living in the city, Margolles became interested in their individual life stories. She developed a project that allowed her to learn more about their situations and their varying personal experiences and to make their voices heard. The participating individuals live in different parts of the city and reflect entirely different life situations, desires, fears, and longings. Margolles was interested first and foremost in learning about their histories of violence in their respective homelands and their situations today in local society. 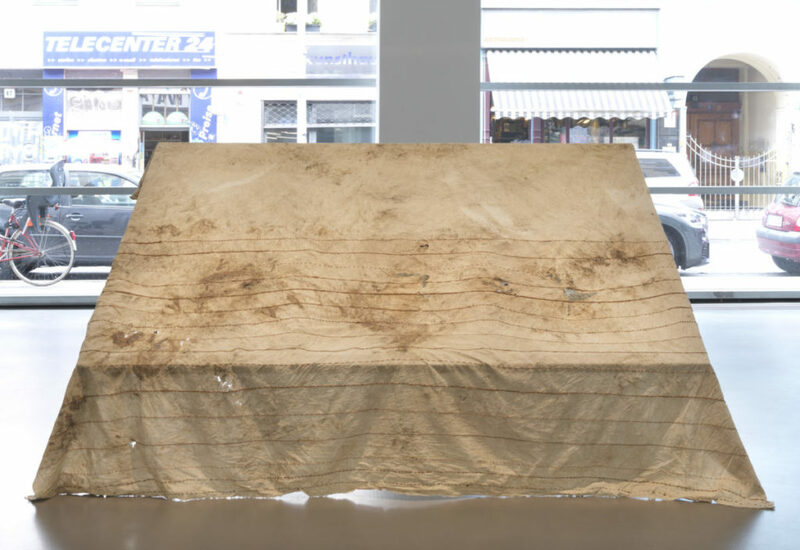 She invited fourteen people to participate in an artistic intervention: a cloth used to wipe up the blood of an individual murdered on the streets of Guadalajara becomes a symbol for narratives laced with violence. Participating individuals each embroidered a line in the cloth and then told their own story. The tradition of embroidery serves here—formally reduced to an abstract line, but each with its own “handwriting”—as a preparatory, meditative process for ensuing narratives. Individual sessions with participants took place from October 2017 to May 2018. The embroidery was completed in silence in the artist’s studio in about an hour. The participants were here confronted with the fabric and its history for the first time. The subsequent narratives were recorded, transcribed, and compiled into a publication. 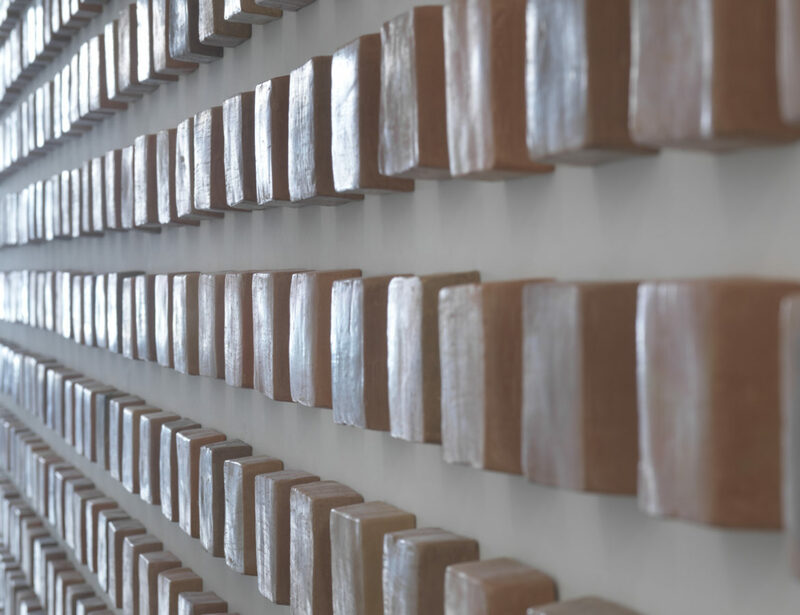 In the exhibition space, passages from the participants’ stories, spoken by themselves in Spanish, can be heard over speakers built into the wall. 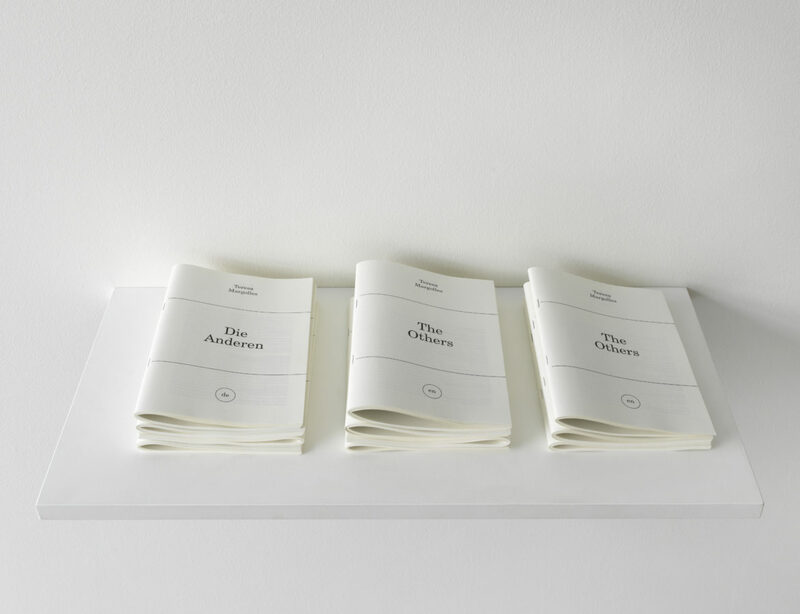 The extended versions of the stories are available in three languages (Spanish, English, German) in the accompanying publication Los Otros / The Others / Die Anderen (2018). 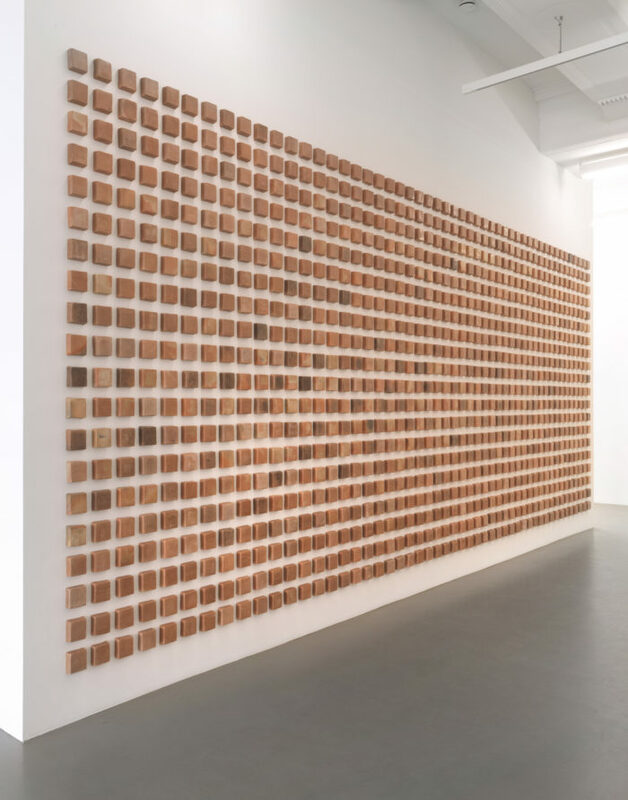 The wall installation La Gran América (2018) consists of hand-formed clay tiles, created with material extracted from the Rio Bravo and further processed in the border town of Ciudad Juárez, both settings of traumatic experiences of escape. The work is both a memorial to the dozens of migrants who perish daily attempting to cross the river as well as those who have managed to escape. With the tiles’ format, Margolles references the culture of remembrance of the ‘Stolpersteine’ that are present everywhere in Berlin. Accordingly, the title The Others encompasses all the groups represented in the exhibition, the living and the dead, the departed and those who have remained, as well as the visitors to the exhibition who are confronted with the works. © Images by Jens Ziehe.